Only have 10 Hours in Cape Town? Cape Town, on the very tip of the African continent, whilst not the Singapore of the European / Asian flight path by any stretch of the imagination, is nonetheless conveniently placed to act as a stopover point for long-haul flights. Already there are tourists who fly into Cape Town en route to Johannesburg. And it will only need a gentle nudge – now that fuel-efficient long-distance aircraft like the Boeing 787 Dreamliner and the Airbus A380 are in the air – to convince airlines to take advantage of everything the city has to offer. 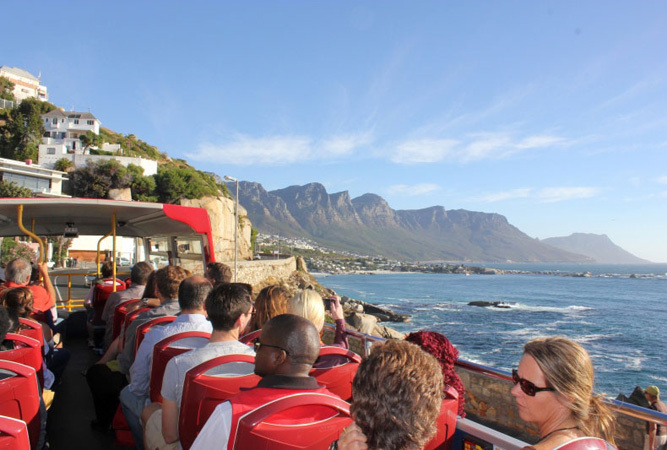 This really is the best way to see Cape Town in fast forward. Including 18 stops in its journey the bus provides a guided tour of the city. It takes in Table Mountain Cable Way, District Six Museum, the Castle of Good Hope, the Two Oceans Aquarium, St George’s Cathedral, the South African Museum, Camps Bay, Sea Point and the Mount Nelson Hotel. If you’re tired and don’t want to have to work too hard at getting around, this is truly the easiest way to do it. There is also a Wine Tour into the Constantia Valley, if exploring one of the oldest and most historic wine farms is on your to-do list. The vibrant Bo-Kaap neighbourhood is the home of the Cape’s Muslim community, whose ancestors lived here as Malaysian and Indonesian slaves. The pretty suburb on the hill is the site of the country’s first mosque and one of the best places to taste traditional spiced Cape Malay food (samosas, lamb denningvleis or chicken kalya). Take lots of pics as the brightly painted buildings against the blue of the sky is irresistible. Famous for holding political figures during apartheid, especially Nelson Mandela, Robben Island, a world heritage site, is a ferry trip from the V&A Waterfront across the bay and well worth doing. At noon every day a gun is fired from Signal Hill, which forms the body of Lion’s Head mountain (just next to it). Signal Hill provides some incredible views out over the harbour, city and the Atlantic Ocean. Long Street buzzes all day and night. This bohemian stretch in the middle of the city bowl is a great place to explore shops, book stores or get a bite to eat in one of the ethnic restaurants or coffee shops. At night it is where people from all over the world bar hop. Long Street is lined with beautiful examples of Victorian buildings with wrought iron balconies, at least a couple of which are now youth hostels. For a double dose of shop trawling and restaurant hopping, head up to Bree Street – regarded as Long Street’s more trendy sister. This entails a bit of a trip out Newlands way, but if you can this 500 hectare garden has gorgeous landscaped lawns and a feast of natural fynbos vegetation, established way back in 1657 by Jan van Riebeeck. The mountain backdrop and the sheer beauty of the gardens is well worth the taxi fare. In Cape Town Central, the oak-lined pedestrian walk of Government Avenue that runs through the beautiful Company’s Gardens (a great place for an impromptu picnic) and on to Adderley Street, gives you access to the National Gallery, Houses of Parliament, the Iziko Museum, the Iziko Planetarium, the Iziko Slave Lodge, the South African Jewish Museum, the Cape town Holocaust Centre, Rust en Vreugd, Koopmans de Wet House and the Gold of Africa Museum. You cannot visit Cape Town without dipping your toes in the water (you may not want to do too much else, as the Atlantic Ocean is pretty cold). Camps Bay and Clifton, close to the city centre, are two beautiful, very popular, and thus sometimes crowded beaches in Cape Town. They’re easy to reach as they’re on the hop-on-hop-off route, and with a day ticket you can get there at any time and stay as long as you like. But if you’re after something a little more secluded, head to Oudekraal a little further on. If you have the time, Boulders beach on the False Bay side of the peninsular, is where you can swim with penguins. Ahhhh beautiful Cape Town! Definitely a good excuse for a 10 hour stop! Great post! There is SO much to do in Cape Town. I love the beaches here, the waterfront, kirstenbosch gardens and all the quirky little restaurants and shops tucked away in the city centre waiting to be discovered.